U.S. stocks continued their recent rally from key support levels, reaffirming the uptrend. Commodity prices (especially gold) continue to fall. The yield curve continues to flatten (the difference between 10-year yields and 2-year yields decreases). Since the yield curve has inverted ahead of every recession in the past 40 years (10 year yields are less than 2-year yields), there are a lot of people watching these numbers. But the lag between an inversion and the start of a recession at least 10 months, so we've still got time to make some hay, so to speak. 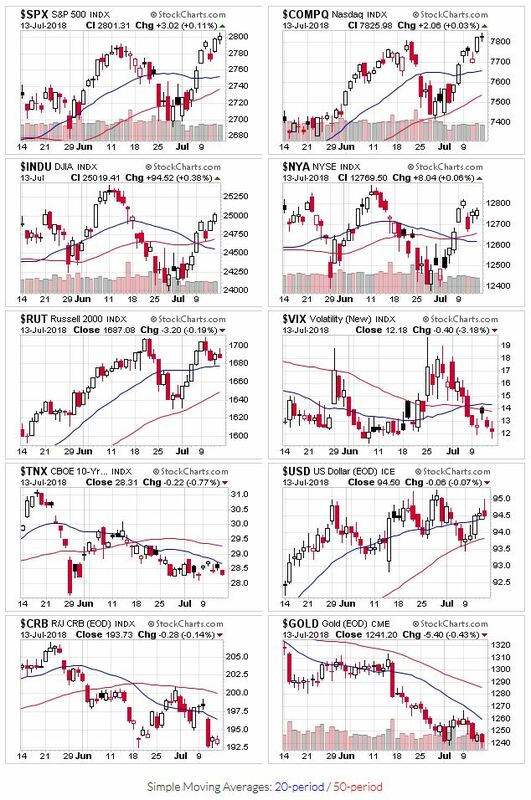 This week, all the indexes start off above their 20 and 50 day moving averages, as the Dow Industrials joined the other market averages above those technical indicators. Trading volume remains low, which isn't a sign of strength for the uptrend. But the lack of selling means distribution days continue to fall off the count. 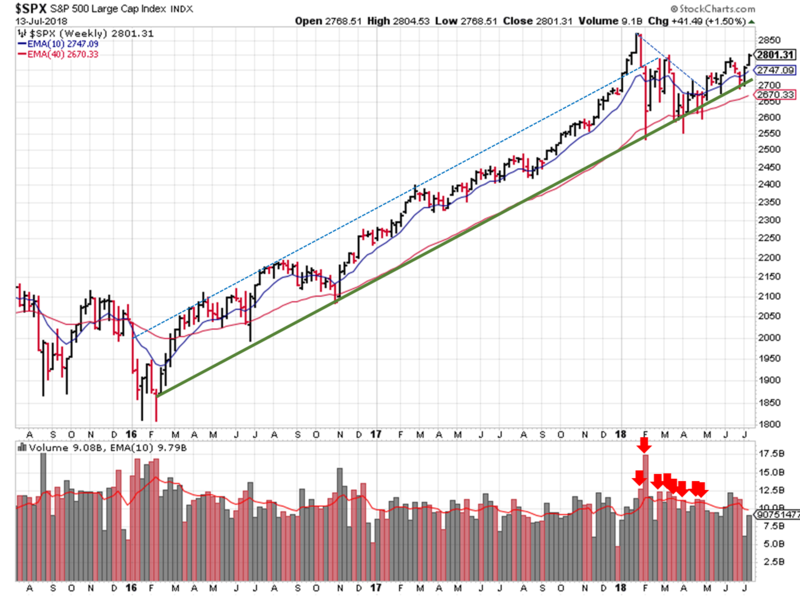 With the averages above their 50-day and lack of high-volume selling, this signal shifts back to an "uptrend" to start the week. OEW also shifted back to an uptrend; the S&P didn't confirm the uptrend as expected. The S&P ($SPX) broke through the 2787 resistance level last week, and we're back at prices from mid-March. 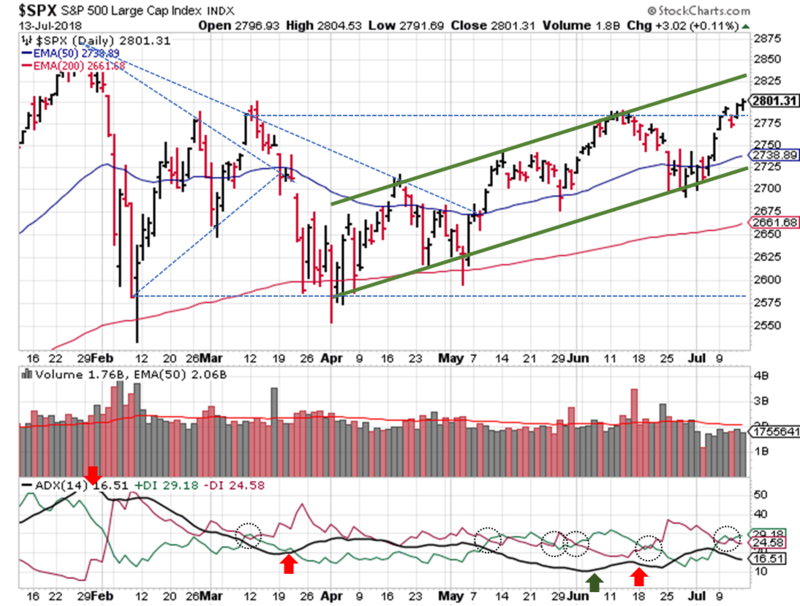 The upward channel remains robust, in terms of providing support and resistance levels. The lower trendline held up really well toward the end of June, saving the uptrend. As of this week, the upper trendline isn't too far off (~2835 or so); if the channel continues to hold, we're probably in for another round of sideways/negative price movement prior to the end of August. For the ADX, the bearish directional indicator (DI-) fell below the bullish indicator (DI+) and the ADX line fell below 20, indicating the recent bearish trend has weakened. Now we watch for the ADX to rise so that we can confirm the bullish trend. Again, since we close to the upper trendline of the channel, any bullishness may be short lived, like early May and early June. Looking longer term, if the S&P finds enough strength to bust out of the channel, the January high at 2872 becomes the next level of resistance.